L.A.'s biking community was excited to see shared roadway bicycle markings (sharrows) being painted on Fountain Avenue in East Hollywood. But then they realized that LADOT misplaced the sharrows by placing them dangerously to the far right of the street instead of the center. 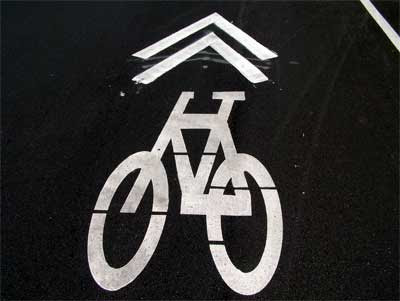 The L.A. County Bicycle Coalition provides a more positive spin on the first sharrows finally painted in the city. There are five more locations where sharrows will be painted in the coming weeks. Celebrities such as Kevin Costner, Ted Danson, Barbra Streisand, Robert Redford and Edward James Olmos are speaking out about the oil spill and the climate bill. Costner testified on Capitol Hill about his invention that separates oil from water. The state Senate passed legislation that would create a buffer between the Del Mar Fairgrounds and the San Dieguito River. This bill would help minimize the environmental impact of the almost 3 million visitors to the fairgrounds every year. The Irvine Company is offering to donate 20,000 acres of open space for preservation and recreation. If approved it would become the largest donation of parkland in Orange County's history. Nipton, California -- a tiny town of 38 residents on the Nevada border -- will provide 85% of its electricity through solar power. The governor has proposed a high-speed rail demonstration project that would be up and running by November and save 50 minutes of commuting time. The Federal Railway Administration will review the proposal.